Each Wednesday during this series on contentment, I will share with you a book that has encouraged me. Today's book is not a new release, but it is one I've wanted to share with you for a while now! Bianca Juarez Olthoff is an author I love for oh so many reasons. I first discovered her through her blog several years ago, and then I heard her speak during the IF: Gathering simulcast. She is incredible, y'all. I kind of feel like she's my spirit animal because she is just so full of sass but she loves. the. Word. 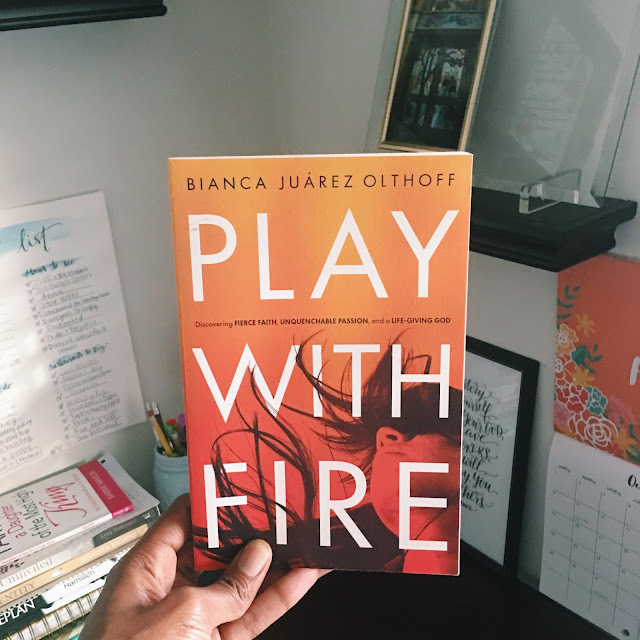 Bianca's first book, Play With Fire: Discovering Fierce Faith, Unquenchable Passion, and a Life-Giving God did not disappoint. I found myself laughing, crying, and underlining up a storm. In this spiritual memoir, Bianca explains how she went from fear to faith. She describes a journey of self-loathing, self-pity, and a severe lack of confidence and places herself in the midst of a story of redemption that only God could dream up. In doing so, she explains how a life guided by the Holy Spirit of God is the best life anyone could have. Growing up in the Baptist church, we did not always talk about the Spirit of God. It seems as though the last few years are when I've really begun to know Him more. One of my favorite verses in Romans says, "For we do not know what to pray for as we ought, but the Spirit himself intercedes for us with groanings too deep for words. And he who searches hearts knows what is the mind of the Spirit, because the Spirit intercedes for the saints according to the will of God." This verse has served as a great comfort to me in times of sorrow. But the Holy Spirit is not just our comforter, He is our advocate, our helper, and our guide. In our moments of pain and confusion, silence and isolation, we must hold on to the promises of God's Word. What is empty can be filled. What is broken can be mended. What is divided can be multiplied. What is dead can live again. Jesus Christ is the living proof. Just as God was faithful to resurrect the Messiah, His Son Jesus Christ, God is faithful to keep His promises to us too. The power that raised Jesus from the grave is alive in us today (Rom. 8:11). And the Spirit is not just promised to perfect people, or pretty people, or polished people, but for all who call on the name of Jesus Christ (Acts 2:21). Can I get an amen? Friend, if you need encouragement to walk through whatever you're facing with confidence in Christ, run don't walk to get this book. You will not regret it.